Grace has a romantic evening planned for her and her husband, David. They’ll have a lovely 25th anniversary dinner and then she’ll show him the tickets for Paris. But David has a surprise in return for her and it’s neither lovely nor romantic, he’s having an affair. So Sarah Morgan’s women’s fiction novel, One Summer in Paris begins. While I loved and was intrigued by Grace’s story, I felt it was diluted by having alternate chapters from Audrey’s POV. Audrey’s story of being a dyslexic daughter of an alcoholic who is just trying to get away from everything wasn’t as compelling to me as Grace’s nor was her romance. However, I loved the rapport between the two women, how they teach each other new things, bolster each other, and offer true friendship. This is a wonderful story of women supporting each other, but I do think that could have been accomplished through one POV. Now if you read my reviews, you may have noticed I am not a fan of angst so the following may surprise you. I felt the end was too neatly wrapped up for Grace and I wanted, of all things, a little angst. I wanted a dilemma, a great deal of soul-searching and received very, very little. Decision outcomes were crystal clear, which made the end to Grace’s story just too pat. For me. 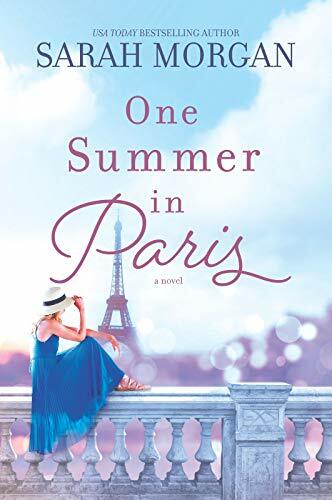 One Summer in Paris would be a great vacation read so I highly recommend it for fans of Sarah Morgan and women’s fiction readers who are looking for something light. Also, if you love books set in Paris, this one very well could be for you. Thank you to HQN books for providing me with an ARC in exchange for an honest review.